Scraped body heat exchanger with pre-stamped double sides for forced circulation of the cooling liquid. 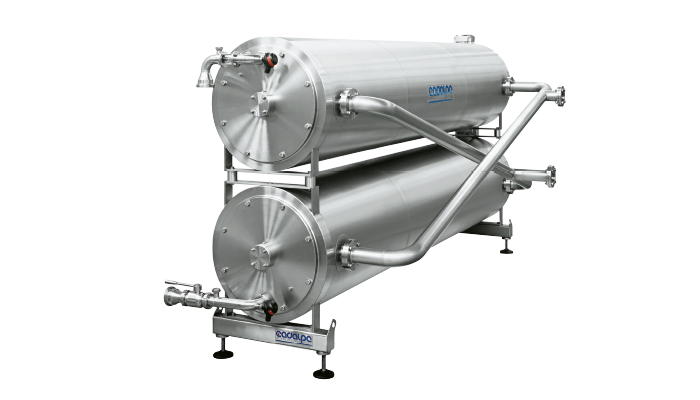 It provides an excellent solution to problems of forced refrigeration and is used when there is a need to reach a product temperature close to freezing point (preservation of juices and must – tartaric stabilization of wines). Comprising two or more units to combine as required, it meets a wide range of needs with exceptional working flexibility and great reliability, even in the most demanding working conditions. All the components are in AISI 304 stainless steel, insulated with injected high density expanded polyurethane.